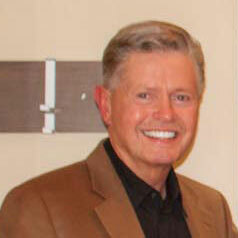 Dr. William V. Nelson joined Augusta Dental in 1988, and became the sole owner in 1999. Dr. Nelson spent his youth in Nebraska and Colorado, considering Falls City, Nebraska his hometown, as he graduated from High School there. Dr. Nelson received his bachelor’s degree from the University of Nebraska - Lincoln and taught high school for one year in Tecumseh, Nebraska. He graduated from the University of Nebraska College of Dentistry and began his dental career in Gretna. He practiced in Gretna until moving into Omaha in 1985 where he practiced in Regency until joining the Augusta group. Dr. Nelson married his college sweetheart, Mary Jane, during his senior year in College. Dr. and Mrs. Nelson’s family include daughter and son-in-law, Jennifer and Shawn Graham, and daughter and son-in-law, Elizabeth and Scott Williams. They are blessed with four grandchildren from the Williams side: Hayden, Isabella, Cole and Blake, and one grandson from the Graham side, Jay. Dr. Nelson is very active in the community, serving on many boards and is presently a board member of Oak Hills Country Club. In his leisure time, he enjoys golf, bridge, traveling, but he is a family man most of all. Receptionist Marian is well-known by each patient at Augusta. She has been with Augusta since its inception and is the most well-informed and personable receptionist in Omaha. Receptionist Elizabeth is Dr. Nelson’s daughter. Elizabeth was part of the team at Augusta Dental for over five years years right after she graduated from college. After taking a break from working outside the home, we’re pleased to have her back working on a part-time basis. Certified Dental Assistant Laura is an artist at her job. Laura has been Dr. Nelson’s assistant for more than 29 years, and is well-versed in every aspect of our practice. Laura was born and raised in Dunlap, IA, and graduated from Iowa Western’s dental assisting program. Dental Hygienist Christy is in her second tour of duty at Augusta Dental. A native of the Omaha metropolitan area, Christy graduated from the University of Nebraska with her hygiene degree. Homepage of Augusta Dental of Omaha, Nebraska.